If you are looking for the Rare Game Pieces for the 2017 Shaw’s Monopoly game, please head here. The Monopoly Game is back at Shaw’s and Star Market for 2015! 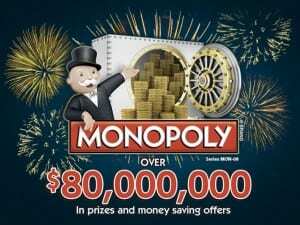 This year Shaw’s is giving away over $80,000,000 in prizes and money saving offers! Every time you shop at Shaw’s or Star Market you can pick up a game ticket at checkout. Look for BONUS items to receive even more game tickets from your shopping trip. The Monolopy game is from February 4, 2014 from May 19, 2015 or while supplies last. (In the past, my store usually ran out of game tickets a few days before). Deadline to submit winning game markers is June 9, 2015. For more information, game rules, odds of winning and more, please head here. Below is a list of (suspected) rare game pieces for the Monopoly board. The bolded numbers for the large prizes are thought to be the more uncommon numbers and more rare than the other piece also needed. Keep in mind this is based on mine and others game boards and may not be 100% accurate but should give you a nice idea whether you have a popular game piece or not. Please feel free to leave a comment if you think there are any errors or mistakes with the above suspected game pieces. Game pieces not mentioned above can be easy to come by so I feel your pain if you don’t have any numbers mentioned above. If you do have a rare game piece, please do your due diligence to figure out value, if any. If you do have a rare game piece and are looking for a partner for another rare piece, you are welcome to leave a comment below but please use caution. Please keep in mind this is a public website and it is not recommended to leave personal information like phone numbers, etc. if you do decide to comment below. Are you playing the Shaw’s Monopoly game this year? Have you won anything in the past!?! Do you have any pieces mentioned on the list above? Free Egg Roll at Panda Express on 2/19/15! Celebrate Chinese New Year at Panda Express where you can receive a Free Chicken Egg Roll on Thursday, February 19, 2015. You do need to show this coupon on your mobile device or a printable copy to receive the free gold bar. No purchase necessary, limit one per person and cannot be combined with other offers. For more information, please head here. Will you be stopping in for a free egg roll at Panda Express? Are you now craving Chinese Food like I am? Score 50% off at Savers! If you are a thrift store shopper, you may be interested in Savers President’s Day sale tomorrow, February 16th. Savers will be offering select clothing, shoes, accessories bed and bath items at 50% off on Monday, February 16, 2015. Also, Club Card Members can shop the sale a day early on Sunday, February 15th. If you are not a club member, you can head here to sign up or for more information. To find a Savers near you, please head here. Believe it or not, next week is February Vacation in Massachusetts. If you are staying put in MA, I feel ya. Below are a list of suggestions for budget-friendly things to during February Vacation week if you and/or the kids have the week off. All National Parks are free from Saturday, February 14-16, 2015! Head to the Prudential Center to get a Pruferred Card for retail, food and more discounts! Enjoy February Vacation week at Faneuil Hall Marketplace with free activities daily! Check out the Blue Man Group and get discount tickets! 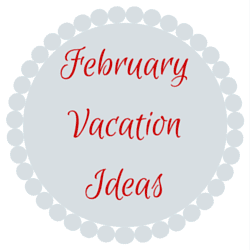 What do you plan to do during February Vacation week? Do you have any budget-friendly suggestions that I may have missed? Please leave any other inexpensive ideas in the comments below! Are you looking for some date ideas in Boston for during these cold and snowy winter days without spending too much money? Below are 5 Date Ideas in Boston for Valentine’s Day weekend and during the cold, winter months! 1. Visit an Art Museum: The Museum of Fine Arts is free with suggested donation on Wednesday nights after 4pm and the ICA is free on Thursdays from 5-9pm. Also, there are other discounts and free museum days for art museums in Boston such as next Saturday, 2/21/15 at the MFA. 2. Enjoy the Boston Science Museum or New England Aquarium: If you have a Boston Public Library Card (any Massachusetts resident can get one) you can request free passes to the Museum of Science, New England Aquarium, and much more! You do have to request passes in advance, especially for popular days. However, this is a great way to check out Boston Museums for free! 3. Check out a Brewery or Wine Tour: Head to Sam Adams Brewery for a free tour (and free beer samples) in Jamaica Plain or pay $5 for a tour of Harpoon Brewery for a fun and inexpensive date idea. If you’d rather a little more romance, check out the Boston Winery in Dorchester with wine samples, pizza samples and a tour of the winery for $10 on Saturdays. 4. Laugh at a Discount Comedy Show: There are so many comedy shows in Boston and there are some great choices on a budget! I had a great date night at Laugh Boston and bought my tickets through Goldstar Boston. Tickets through Goldstar Boston were actually free and I just had to pay a service fee of $6 each. Also, comedy clubs like Improv Boston have free shows during open mic nights and more! 5. Take a class together: Stores like Williams Sonoma offers free technique classes and would be a cute way to spend time together for free learning something new! Also, check out your local community college or local town for cheap classes that would be perfect for date nights like dances classes and more! Also, if you are looking for ideas exclusively for Valentine’s Day weekend in Boston, all National Parks will be free from February 14-16, 2015 and may be a good chance to enjoy a National Park for free if you can take a break from shoveling! Also, check out daily deal sites like Groupon for discount local activities and restaurant deals for more date ideas. Even better, use promo code LOVE20 to save 20% off Groupon deals through 2/10/15! Also, Restaurant.com always has food vouchers for local Boston restaurants and more so make sure to check them out as well! 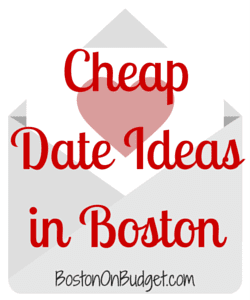 If you are looking for even more date ideas in Boston, make sure to head here! Also, don’t forget to check out the Boston Cheap Eats page for happy hour deals and specials, which would make for a great appetizer and more before or after an activity! What is your favorite cheap date idea in Boston for the winter? *This post contains affiliate links to Groupon and Restaurant.com. Please read my disclosure policy if you have any questions. If you have (yet another) snow day on the books and looking for a little entertainment besides shoveling, I’ve compiled a list of sites and sources to watch movies online for free. 1. YouTube: YouTube has a good number of full movies available online for free. A lot of the movies are older or are Hallmark type movies, but there are a lot of good options for a snowy day. A lot of the free movies available for streaming on Netflix are actually also available on YouTube as well, it’s just not as nicely organized. 2. Amazon Prime: If you are an Amazon Prime member, you can stream movies online for free. The selection and quality is a little better than YouTube in my opinion, but some of the better movies you do have to pay for. However, Amazon now gives you a choice to waive your 2-day shipping for a free $1 movie credit. This is a great option if you are not in a rush for your package and the $1 credits can add up quickly depending on how much you shop. You typically have a few months before your Amazon video credits expires. (You can also sign up for a free 30-day trial to Amazon Prime but you may find it more worth your while during the holidays for free 2-day shipping). 3. Hoopla: If you have a Boston Library Card (or another local library card), you can stream movies right from your laptop with Hoopla for free from the library. You can also borrow movies in person from your local library (or college library) for free, but with Hoopla you don’t have to leave your house. 4. Through your Cable Provider: If you pay for cable, you can watch a lot of movies through your TV or laptop for free. Simply sign in to your account online to stream movies online. Also, you can head to directly to a network to browse movie offerings. For example, last week ABC Family had Pitch Perfect available to stream online for free, you just needed to sign into your cable provider. However, some networks for certain movies don’t require authorization. Keep in mind with Redbox, you can use a different credit card with the same promo code to get even more free movies. 6. Netflix or Hulu trial: Netflix and Hulu both offer TV and movie streaming online with a subscription fee; however, if you sign up for a trial you can receive free streaming. However, just remember to cancel your membership if you don’t want to pay for the service and just want a week or a month of free streaming. Also, if you have a friend or a family member that you really trust that has a service, you may want to share or exchange services. For example, if you have an Amazon Prime membership and a friend has Cable, you could share passwords, but make sure it is someone you really trust and the password isn’t tied to all your accounts. 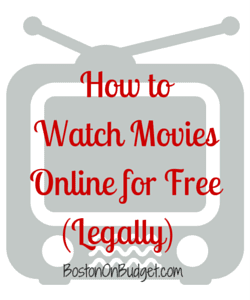 Your turn… how do you watch movies online for free and legally? Did I miss any of your favorite sites? *This post does contain an affiliate link. Please see my disclosure policy here.